*THIS IS A SPONSORED POST. ALL OPINIONS ARE MY OWN. CONTAINS AFFILIATE LINKS. Do you ever feel like after Christmas everything looks so bare? It freezing outside and everything has gone dormant. 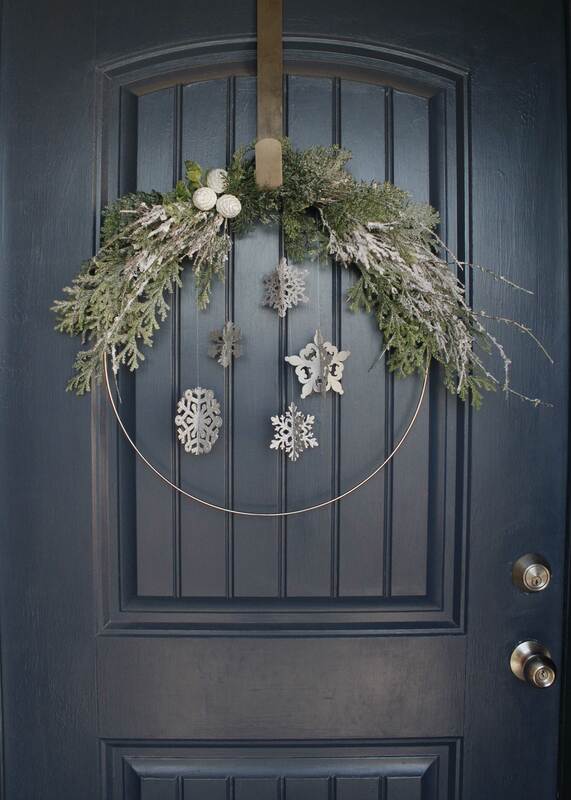 Here is a fun winter wreath to add to your cold front door! Winter can be so beautiful, slightly frosted trees, and snow covered yards. Let’s embrace it’s beauty and highlight the wonderful things about it! I loved the simplicity of this piece and how fun and unique it is! Keep reading and get the full tutorial on how you can make your own. 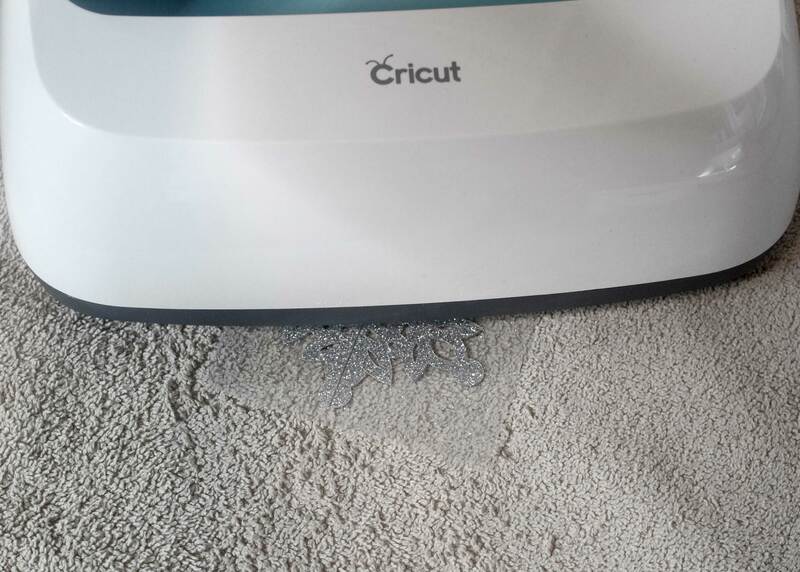 Enter the giveaway at the end of this post for your chance to win a Cricut Maker machine!!!!! CLICK THE LINKS BELOW TO PURCHASE ANY ITEMS IN THIS POST. 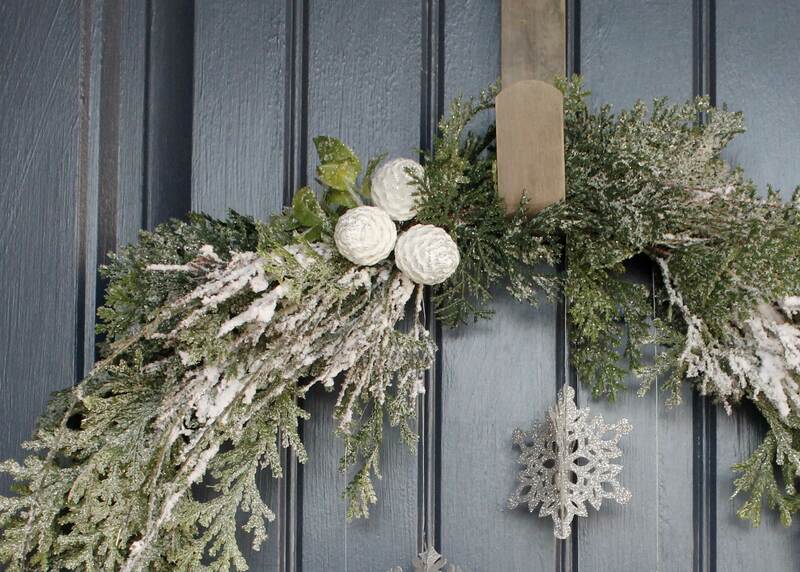 I love how simple, yet beautiful this wreath is. 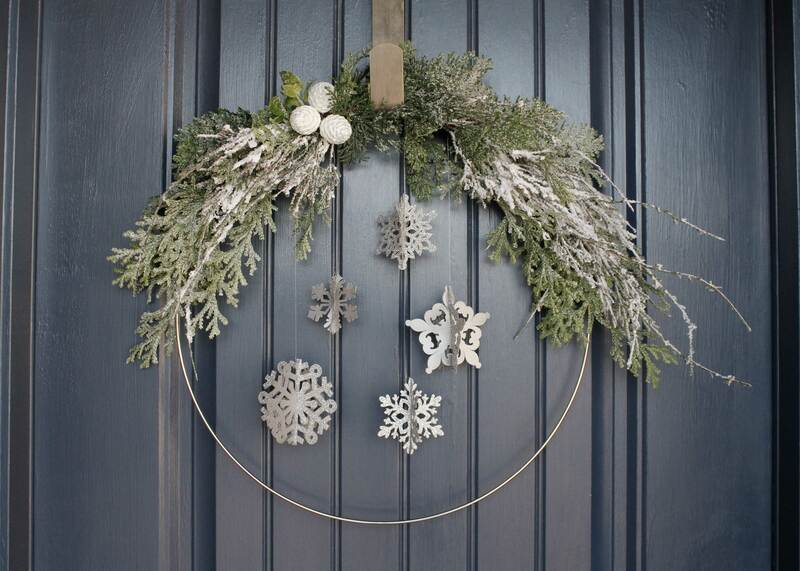 The base of the wreath is a giant hoop ring that I found at Hobby Lobby for $3.99 in the craft section of the store. I wanted something that was flocked to give it that real Winter feel. I visited Taiwan, a whole sale decor store here in Midvale , UT. They have a huge variety of all things greenery, christmas, ect.. I could spend an entire day there, it’s so fun. I got 2 large, 3 medium green stems and then 1 large flocked branch. Using the floral wire, attach your greenery to your hoop one piece at a time.Layer your next piece on top until you have all the greenery attached how you want . Attach the acorns into the center where your sticks all came together. I actually did mine just off center to the left. Hot glue a couple small leaves behind just to finish it off. 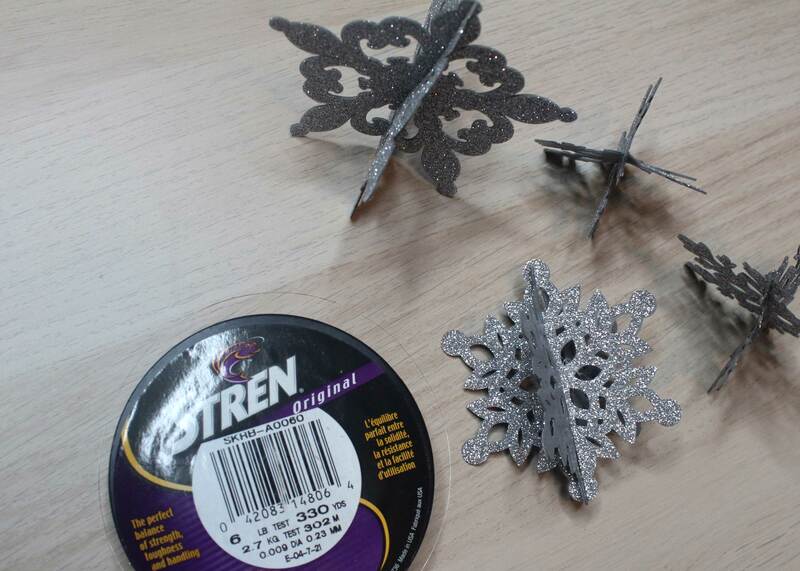 You can see that there are 4 of every snowflake. This is because I wanted the leather to be double sided. I used the Silver, Glitter Iron-on material to finish off the back of the faux pebbled leather. That way when the snowflakes would spin it would be pretty on all sides! 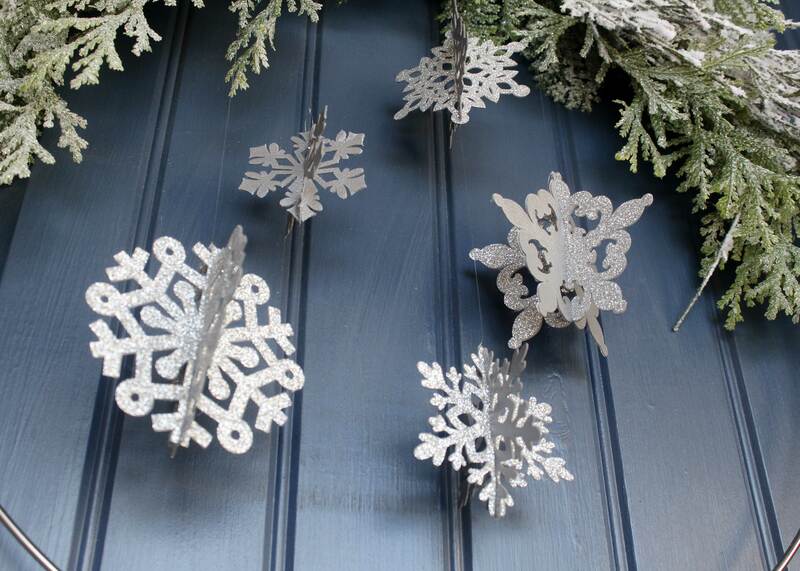 If you are making your own, you will want to choose your snowflake. Adjust the size to what you want, duplicate it, then ungroup the image. You will see the slits are opposite. Make sure that you change the color for cutting purposes. You will want each image in both colors. The purpose of this is that the grey ones are the leather, and the white are the iron-on material. 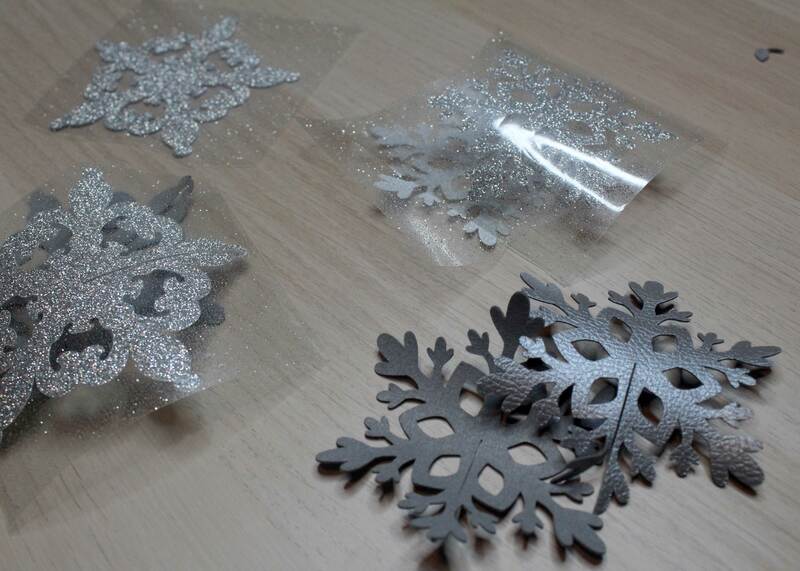 You need one white and one grey for each piece of the snowflake. 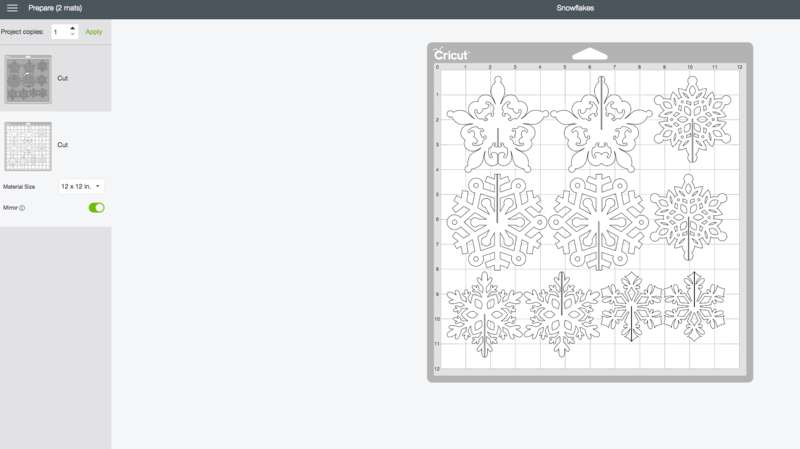 Send the images to the Cricut Maker machine be cut. This machine is absolutely unbelievable and cutes both of these materials like butter.Make sure when you are cutting the white set of images that you mirror them. You want it to opposite since it is going on the back of the leather. I would suggest cutting out the iron on glitter material first. That way you can be weeding it while the leather is cutting to save time! The Glitter iron-on is very hard to see the cut lines, so I like to use Cricut’s Brightpad. It makes weeding so much easier and makes those lines pop right out. When all the leather and iron-on has been cut out, you need to attach each one together. Turn the leather pieces right side down, so you have the back facing up. Place the matching Iron-on piece directly on top of it and line up all the edges. Using the Cricut EasyPress, attach the two pieces together. 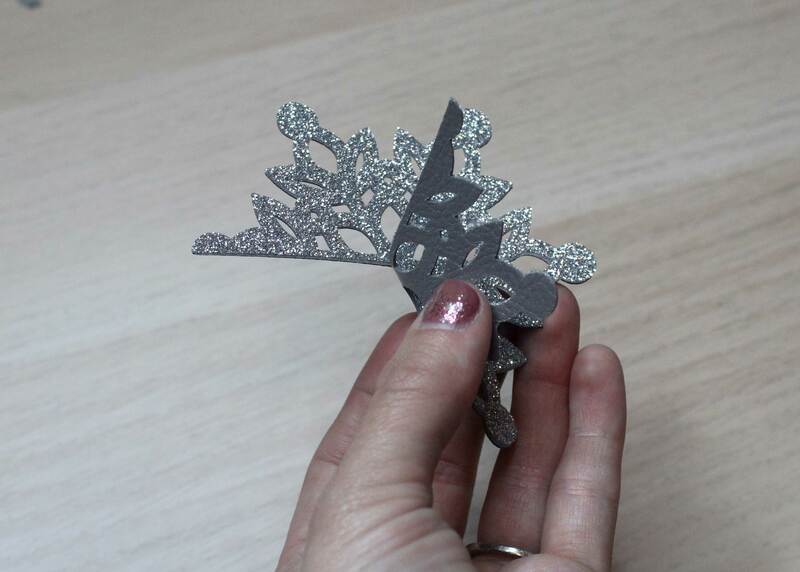 Now you will have 1 piece of the snowflake and it will now be double sided!!! 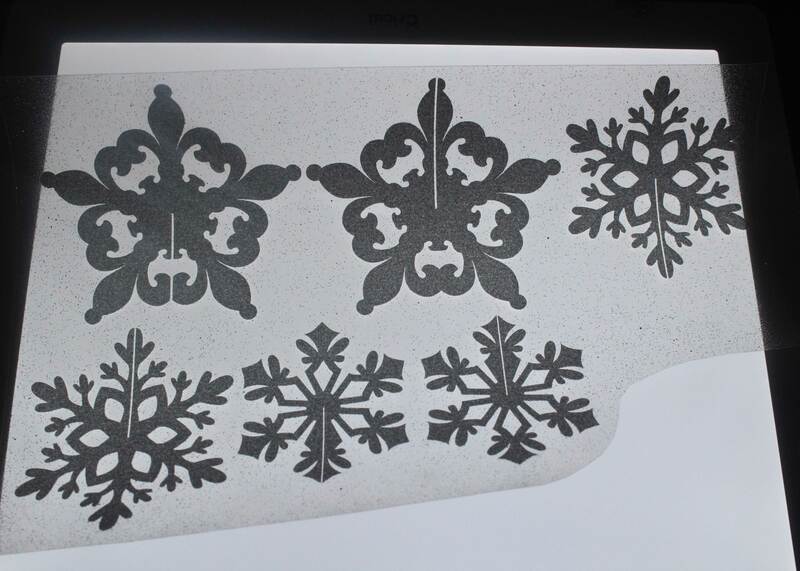 Repeat this step for all the snowflakes and then slide the two pieces that go together, together. 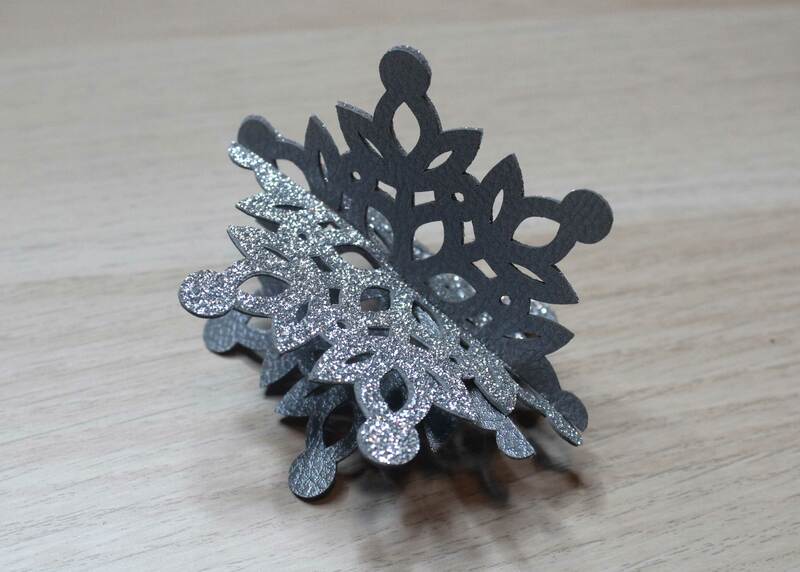 Look how beautiful that 3D snowflake is!!!! The cool thing is that it will be durable for the weather too! 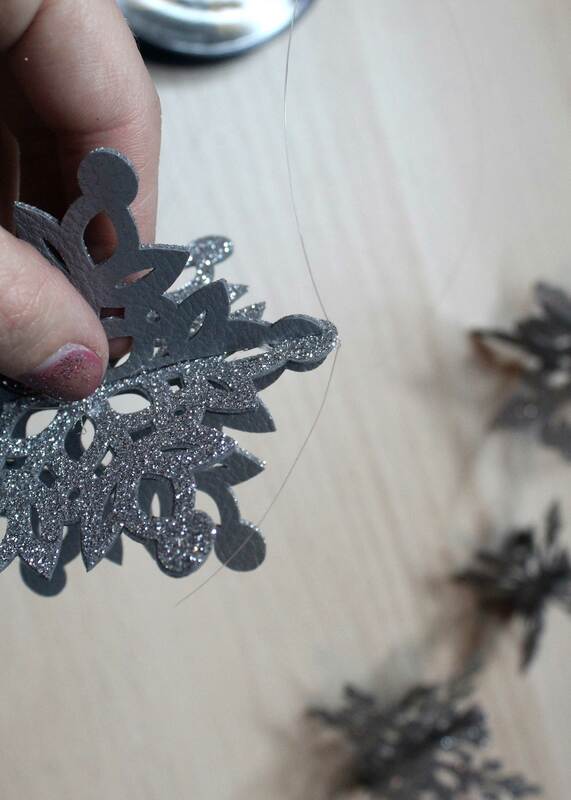 To make the snowflake stay together permanently, use a tiny bit of hot glue to attach the inner pieces where the slits were. Repeat this step for all the other snowflakes. When they are all finished, you need to attach the fishing line to them so we an hang them from the wreath. I threaded the fishing lone through the open holes and tied a knot a couple times and then left a long string so i could adjust the height where I wanted them. 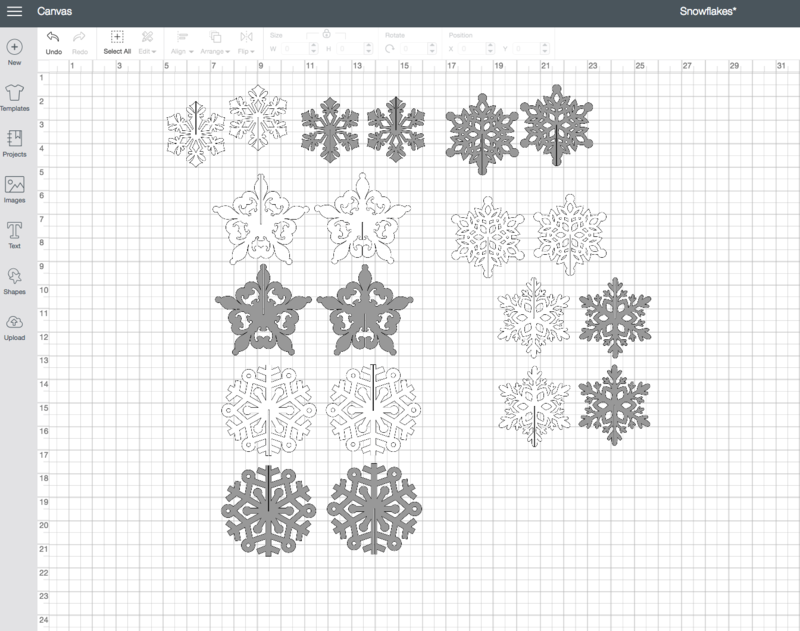 I adjusted all the snowflakes at different lengths so they could all move and twist in the wind. Please feel free to leave any questions you might have below and I would love to answer them!! DO YOU WANT TO WIN YOUR OWN CRICUT MAKER MACHINE?? Previous ArticleCRICUT CYBER MONDAY SALE EXTENDED!!!! !